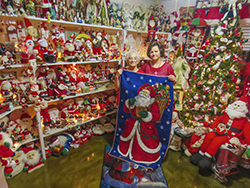 Linda Secovich, right, and her mother, Norma Jean Clinton, have collected Santa and Mrs. Claus figures and decorations for some 35 years. The entire 6,000-piece collection fills a spare room at the Secovich house. Mother and daughter hold a whole-cloth Santa quilt hand stitched by Clinton. What does Santa Claus really look like? Is he a tubby old man in wire-rim glasses or a saxophone-blowing hipster? A kindly father figure or a bearded biker? These are but a few of the 6,000 interpretations of Santa (and Mrs. Claus) collected for decades by Dixie Electric Power Association member Linda Secovich and her mother, Norma Jean Clinton. The collection eventually outgrew her house “so she boxed them up and brought them here,” Secovich said, referring to the home she shares with husband Charlie in Covington County. The collection remained packed away until the couple’s children left home. Then Charlie built shelves in a spare bedroom and out came the Santas. 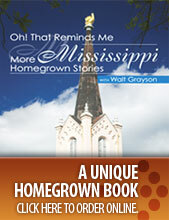 The items are grouped according to theme or function. There are patriotic, collegiate, nostalgic, singing and dancing, golfer, hunter, cowboy, comic book and snow skier Santas, to name a few. Nestled among the figurines are Santa-themed jewelry items, baby rattlers, flashlights, mugs, candles, kitchen ware, slippers, dog clothing, buttons, music boxes, outdoor decorations, even bathroom accessories. Most are mass-produced items, the kind that begin filling stores before Halloween. But some are one-of-a-kind, made by skilled hands. “The handmades are my favorite,” Secovich said, referring to the Santa images painted on crab shells, sand dollars, gourds and cypress knees; carved in wood; stitched into quilts; and crocheted into soft toys. A favorite figurine of this retired high school geometry teacher is her teacher Santa, standing before a class of pint-size Santa students seated at tiny desks. Some of the Santas sing or rap and swing their hips, to the delight of Secovich’s four grandchildren. One Santa takes a spin in a red lowrider. Romantic Santa smooches with Mrs. Claus, and devout Santa cradles baby Jesus in his arms. Strings of Santa-shaped lights and a Christmas tree sprinkled with Santa ornaments complete the festive year-round display. And it just keeps growing. Secovich and her mother still enjoy scouring flea markets and thrift stores together in search of secondhand Santas. “That’s where you find the most unusual ones,” Secovich said. She is frugal in her purchases, while her husband tends to splurge; he sprang for the brand-new biker and lowriding Santas as gifts for his wife. And he’s likely responsible for the camo-clad Santa. “I say my husband hunts deer and I hunt Santas,” Secovich said.